Family & Co. Jewelers: Be More Careful With Your Diamond Rings! Be More Careful With Your Diamond Rings! 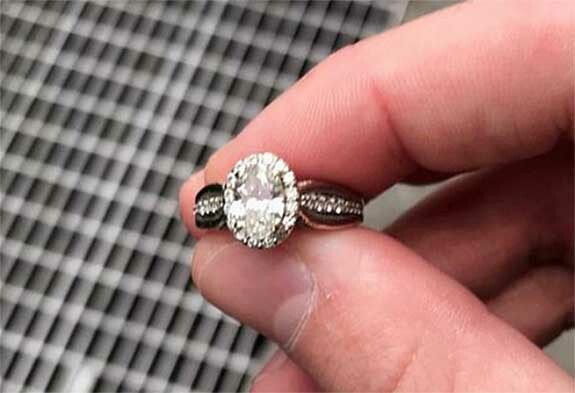 For the second time in just five weeks, the New York City Police Department has rescued a diamond engagement ring from a utility grate near Times Square. The metal grates, which were once famous for consuming spiked heels and small change, are now menacing diamond rings at an alarming rate. The NYPD went as far as to send out this tongue-in-cheek public service announcement via its Twitter page: "PSA: Attention all newly engaged! Please avoid sewer grates at all costs! Thank you" As we blogged about in December, a British couple became international celebrities after a video of them losing her brand new diamond engagement ring down a utility grate in Times Square went viral. On January 5, the Twitter account for NYPD Midtown North was buzzing with more news about a diamond engagement ring that was rescued from a utility grate at 48th Street and 8th Avenue, just a block from Times Square. The post; which includes a photo of an oval diamond in a halo setting; gives credit for the recovery to the NYPD's Neighborhood Coordinating Officers (NCOs), Emergency Service Unit (ESU) and the Fire Department of New York City (FDNY). Unlike the British couple who reveled in their fiftenn minutes of fame, the woman who lost her diamond ring at 48th Street requested to remain anonymous.